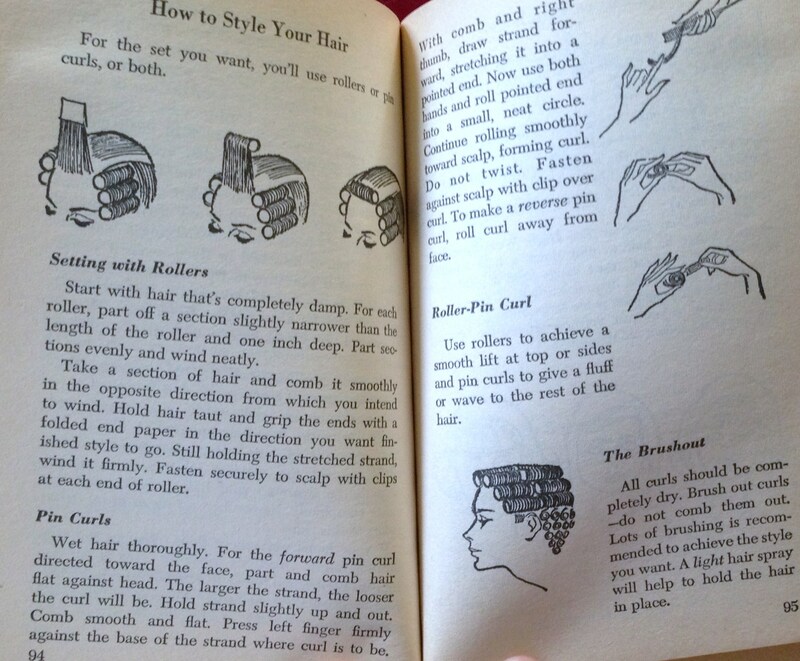 Welcome to my latest Weird Words of Wisdom post about a vintage advice book for teens–and to my 100th post on Embarrassing Treasures! About the Author: Betsy Keiffer was a writer and editor at McCall’s Magazine. Born Elisabeth Corrigan in 1923, she married a painter named Edwin Keiffer in 1950. You can read about their lives on a web site that their children created about their father’s work. Betsy Keiffer, who died in 2006, was also the sister of New Yorker writer Faith McNulty. McNulty’s 1980 bestseller The Burning Bed became a memorable TV movie vehicle for Farrah Fawcett. “Charm bracelets that clank so they drown out conversation.” That must involve a huge charm bracelet and some really wild gesturing. Welcome to a new feature that will occasionally substitute for my weekly series Weird Words of Wisdom. Readers of that series know about my interest in the teenage experience–and especially in the messages that adults have provided to teens through the years. Fueled by this interest, I have amassed a collection of vintage advice books for teens, as well as vintage teen magazines. Today, we will explore one of these magazines. Co-Ed is a publication we’ve encountered before. Published by Scholastic from 1957 to 1985, Co-Ed targeted girls in home economics classes–both “career girls and homemakers,” as the cover states. This 1959 Christmas issue includes an out-of-this-world mid-century gift guide; lots of holiday food, decorating, and fashion ideas; and fearless predictions about the brave new world of 1980. All this and Gay Head, too! So park your bird-car, get comfortable in your underground burrow, cozy up to your atomic brain, and let’s dive in to Christmas 1959. We’ll start with a closer look at this magazine’s cover. Perhaps we can glean some subtle clues about its original owner. This girl sure enjoys watching her fella hang his balls on the tree. Notice the creative gift-wrapping ideas. Sure, they’re corny, but with some minor updates, I bet they would take Pinterest by storm. I have a inexplicable hunch that the owner of this magazine–a girl named Cassandra–liked a boy named Lee. Can you find another hint here? Another lovely holiday centerpiece idea. Of course, your menu is paramount. What could be more Christmasy than a processed-cheese-based dish festooned with pimento-stuffed green olives. Skewered Brussels sprouts and pickled onions make a nice accompaniment. Of course, you want to look as pretty as your holiday decorations. Here are some hairdo ideas–the one where you just slap a flower on top of your head is my favorite. Consider it for an office party. We all know that being a woman involves a LOT of beauty maintenance work. 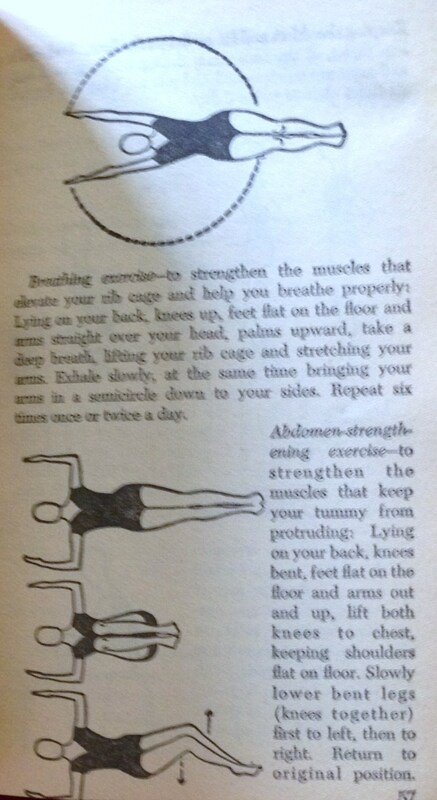 Did you know that includes foot exercises? Well, it does–so start stretching those toes! Picking out the right gift is always tough. I think we can all agree that most women could use a “corduroy jumper coat” to wear to the breakfast table over a cotton nightie. Wow, Dad is Don Draper. If you’re too young to buy him what he really wants–booze–that set of international drinking glasses is probably the next best thing. Don’t forget his other vices–that table lighter “with adjustable flame for lighting cigarette, pipes, or cigars” is pretty sweet. That “Space Man” novelty shaving lotion is AWESOME. Don’t waste it on Uncle Ed. Give it to your “steady man” instead of the hemp belt. Let’s take a moment to look at some of this magazine’s ads. This one features two teens so acne-free that they can rub their faces together without fear. Actually, I think he’s a little bit afraid of her teeth. Premium with Purchase: Arthur Murray dance book–a $1.75 value! Okay, if you replace 1980 with 2000, and atomic brain with Internet, that last one was actually pretty good. Way to go, Michael O’Connor from Oakland, California! Co-Ed’s editors made some predictions, too, about “fabrics of the future.” They envision chemical fibers “which will shrink or grow on the wearer, so there will be no need for clothing alterations.” They also imagine clothing that adjusts to the surrounding temperature, keeping the wearer comfortable in any environment. By what date do they anticipate these innovations being available? 1970! We close our look at this magazine with the work of our favorite teenage advice columnist, Gay Head. I have to agree with that. The teenage advice book market has certain subsets. Religious books, especially those from an evangelical Christian perspective, are common. So are books that focus on beauty and fashion. Not many authors attempt to combine these two perspectives. Charlene Johnson, though, was both a model and the wife of a budding minister. Knowing nothing more about her than what’s in this book, I can tell she brings a lot of enthusiasm (as measured by exclamation points) to both roles. Really? Never? Even if you’re at the supermarket, staring at the cereal selection or something? Well…this one I can get behind. By the way, Johnson’s seminary-student husband did the illustrations for this book. You ain’t seen nothing yet: “If I could only tell you girls how deeply concerned I am with the shocking divorce rate in our country.” The U.S. divorce rate doubled between 1960 and 1980. It has since declined slightly. Sweet and feminine:“This miss is usually small in stature, soft spoken, and fair.” She should wear full skirts, pastels, and flowers in her hair. Sporty: These types should wear “tailored, tweedy clothes” and woodsy colognes. An echo in here: On the subject of makeup, Johnson writes, “Young eyes need no enhancement. They have their own sparkle and fire.” This is oddly similar to the wording in another book we’ve looked at—Once Upon a Dream by Patti Page, also published in 1960. Page wrote, “If you’re young and healthy, your eyes have enough sparkle and fire without needing any ‘extra added attractions.’” I’m not sure what to make of this. Maybe young eyes having “sparkle and fire” was part of the zeitgeist in 1960. This week’s offering in my Weird Words of Wisdom series will help you get your glamour on for upcoming holiday celebrations—or at least help you learn to stand like a model. About the Book: This 25-paperback, written by “famous model” Betty Cornell, purports to offer the secrets of beauty and popularity. Actually, it focuses mostly on grooming basics. It’s lucky that 1958 readers didn’t know her 1940s stats, or they might have raised skeptical eyebrows at all her cautions against starvation diets and overly dramatic weight loss. In 1951, when this book was first published, Cornell had aged out of her career as a junior model. Writing books for teens was the start of a new career. 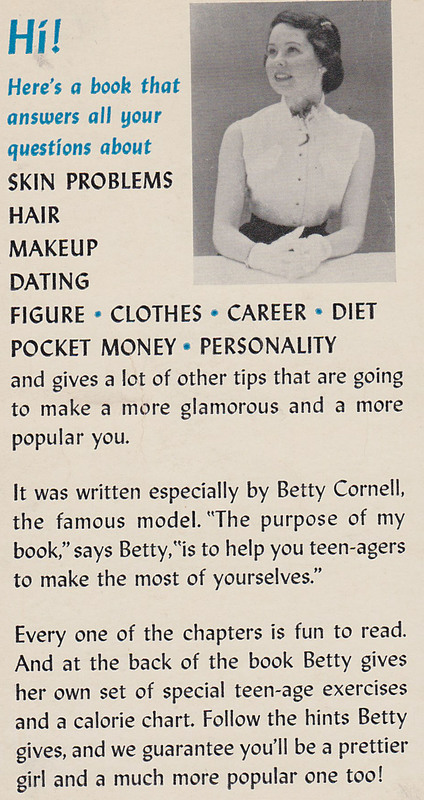 Her other titles would include All About Boys, Betty Cornell’s Teenage Popularity Guide, and (more oddly) Betty Cornell’s Teenage Knitting Book. In 1952, she married John Joseph “Jack” Huston of Philadelphia and went on to raise three children. Jack died in 2010, at which time Betty was still alive. In 1977, she was one of several former models interviewed for the book Eileen Ford’s Beauty Now and Forever: Secrets of Beauty after 35. Now that’s a book I’ve got to get my hands on! One good basic suit in a neutral color. A good basic coat, box cut or flare cut. Breakfast: Half a grapefruit, 1 poached egg on rye or whole wheat toast with small amount of butter, 1 glass of milk. Dinner: 1 glass of tomato juice, generous serving of broiled calf’s liver, serving of cooked carrots, tomato and lettuce salad with lemon juice, fruit Jello, milk. The liver alone would do much to control my appetite. This is the latest installment in my Weird Words of Wisdom series. About This Book: Your Manners are Showing differs from most vintage teenage advice books in one key way—it shows teens how to behave with copious illustrations by Betty Betz. Verses by Anne Clark accompany the pictures; in between the illustrations, Betz provides short chapters on topics ranging from money to “vice” (drinking and smoking). Etiquette in verse actually strikes me as a pretty handy aid for mastering tricky concepts, like who gets introduced to whom. About the Author: Where do I begin? Betty Betz journeyed from Hammond, Indiana, prom queen to 1940s and ’50s queen of all media. She was a Midwestern swimming champion, and her high school classmates named her Most Popular Girl in their school of 1,800. She attended Sarah Lawrence College and earned a guest editorship at Mademoiselle, which became the first magazine to publish her drawings. She went on to work for Esquire and Harper’s Bazaar. Eventually, she began to specialize in teenagers, writing a syndicated advice column for them and publishing several books. Her illustrations of teenage life turned up on everything from stationery to scrapbooks to jewelry boxes. She was married briefly to Josef Lanz, the Austrian fashion designer who popularized the dirndl dress, a 1940s teen wardrobe staple. His family owned Lanz of Salzburg, which still exists, producing mostly nightgowns. In 1956, she married her second husband, Frank McMahon, whom Time described as an “oil-rich Calgary wheeler-dealer.” She raised two daughters and settled down into a life of charity work and Palm Beach socializing. Betz died in 2010. She marketed a line of teenage clothing that included a hideous but creative item called a blouse-slip. As a slip, you could lounge around in it at home. If company stopped by, you could wrap a skirt around yourself and be good to go. She published Manners for Moppets, an etiquette book for children, in 1962. At the time, her family shuttled among homes in Vancouver, New York City, and Palm Beach. “An English nanny and a private plane make commuting painless,” The Calgary Herald wrote. “Having complete wardrobes in each house so she doesn’t have to pack and unpack all the time and hiring temporary help for each house as she gets there are other time and trouble savers.” I’ll bet. For the most part, I’ll let Betz’ illustrations (and Clark’s verse) speak for themselves. I can’t resist including a few quotes, though. On smoking: “If you like the taste of tobacco and your parents approve, there’s nothing harmful about smoking in moderation. Recommended non-alcoholic drink if you want to appear to be drinking alcohol: A “Horse’s Neck”—ginger ale, with a slice of lemon peel. Read more Weird Words of Wisdom. 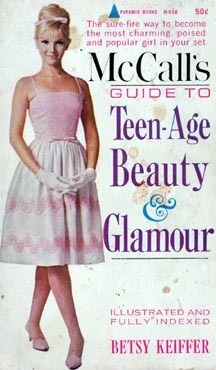 About the Book: For the latest entry in my series on vintage advice books for teens, we turn to this Scholastic book club offering, chock full of advice for improving every aspect of a girl’s looks and personality. The fashion section makes me sad that I was born too late for hats and little white gloves, though I’m happy to live without girdles and curlers. About the Authors: Scholastic published Co-Ed Magazine from 1957 to 1985. According to the New York Times, Co-Ed targeted girls in the home economics field. (Scholastic replaced the magazine with Choices, a classroom magazine for teens of both sexes, which still exists.) As we have seen in the past, Margaret Hauser edited Co-Ed Magazine for many years, and she and other Scholastic personnel often wrote advice books under the pseudonym Gay Head. It’s a shame they didn’t do so with this one—that name would make a lovely complement with the cover image. Recommended Amount of Time to Devote to Bathing and Beauty Treatments: An hour each night, extended to two hours once a week and to three or four hours once a month for intensive maintenance. Recommended at-home wear: Skirts or culottes, pants or Bermudas, with classic shirts or knit tops. DOs for this type: Shirt-waist dresses, bold prints (including “coin-size polka dots”), large accessories. DON’Ts: Too slim skirts, deep V necklines, vertical stripes. DOs: Vertical and diagonal stripes, middy collars, cardigan tops, three-quarter sleeves, straight or gently flared skirts. DON’Ts: Princess dress lines, pleated skirts. DOs: “The princess line, with its snug-fitting bodice and flared skirt,” straight sheaths, softly tailored suits, delicate buttons and jewelry, knife-pleated skirts. DOs: Skirts with “gentle gores or center pleats,” narrow self-belts, cardigan-topped outfits. Fearless Charm Inventory: The book includes inventories to help girls assess their charm levels. To the authors’ credit, they include prejudice, along with shyness and laziness, as a barrier to charm. The original owner of my book was not prejudiced or lazy, just shy. a.) You look so awful. b.) I missed seeing you around. c.) Sally’s been dating your boyfriend.